This year, as Friends of Third Place Commons prepared for our annual fundraising Breakfast, we hit a few bumps in the road. One of our honored guests was out of town in mid-February, so we set the date two weeks later. Brilliant idea, something we will do again because it gave us more time to organize and fill those tables. Then, just a few days before the event, Allen Schauffler, our intrepid Master of Ceremonies for eight of the last ten years, was sent out of town on assignment. What to do? Dr. David Shere from the Music Center of the Northwest entertains Breakfast guests with music from the ’60’s. Simple! We started the Scher-Sher-Shere show early. Steve Scher, interviewer extraordinaire and a local treasure, was already on board to interview Ron Sher, the visionary behind Third Place Books. 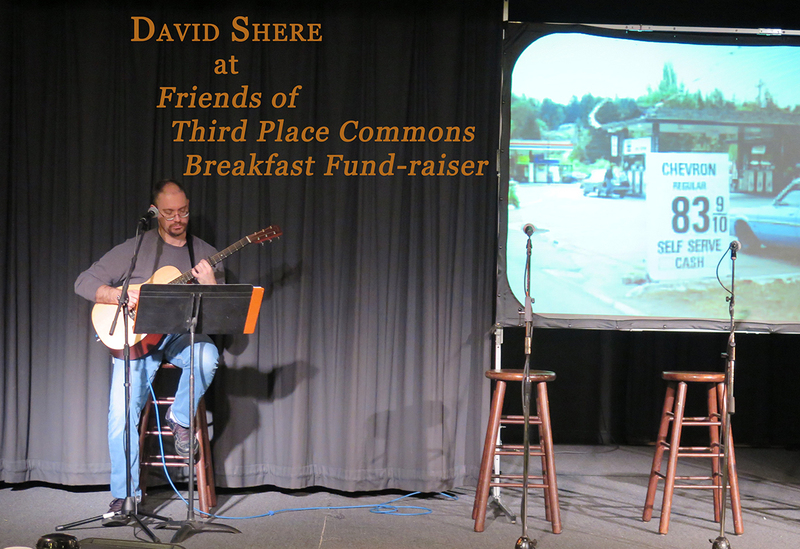 Right after musician David Shere completed his first set, Steve took the podium, read Allen’s greeting, and our biggest breakfast ever, with over 270 guests, was off and running. This year, we marked several significant anniversaries. The Town Center opened 50 years ago, and as we saw in Aaron Stadler’s slide show , the mall has gone through several evolutions. And it has had its share of owners. In October 2014, Merlone Geier purchased the property from Madison Marquette. During the months we awaited word of the final sale, supporters of the Commons held our collective breath. Would the new owners recognize the value of Third Place Commons, and of the little non-profit organization that produces over 900 free, public events every year, and runs the Lake Forest Park Farmers Market? We are delighted to answer that question with a resounding yes. We started the Breakfast festivities by thanking Merlone Geier for continuing support of the Commons and the weekend music program. Board Chair Ros Bird presents the Friend of the Community Award to Ron Sher of Third Place Company. Every year, Third Place Commons honors one community partner for service above and beyond ordinary support. This year, Ros Bird, Chair of Third Place Commons, recognized Third Place Company for 15 years of vision and support. 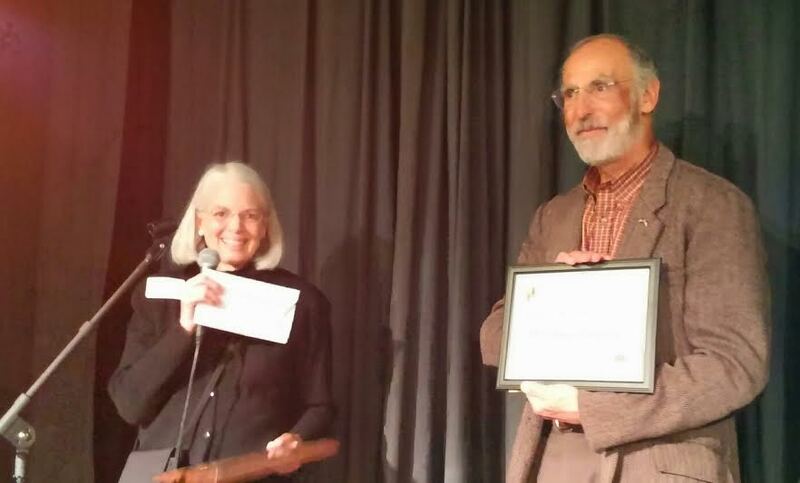 After accepting the award, Ron Sher was joined on stage by Anne Stadler, the founder of Friends of Third Place Commons, and Steve Scher asked both of them about how this space came to life. Steve Scher (right) interviews Ron Sher and Anne Stadler. Ron began by recounting how he was influenced by Ray Oldenberg’s book The Great, Good Place, in which he describes the power of informal, common places like pubs and taverns where everyone in the community is welcomed. When he looked beyond the empty storefronts of a nearly deserted mall in Lake Forest Park, Ron envisioned a thriving bookstore. He also saw the potential of a third place where readers linger over a cup of coffee, neighbors see each other often, and people drop by to be “at home” in public. He leased much of the mall’s top floor and sublet space to several local restaurants, including the Honey Bear Bakery, a much loved Seattle institution. Rather than building another standard food court, he created the Commons, and furnished it with comfortable places to sit, a giant chessboard and a stage. 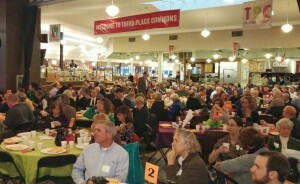 Third Place Books opened in November 1998, and while the community immediately embraced this vibrant new business, the Commons presented a challenge. Book store staff couldn’t take on a full schedule of public events, and without leadership from the community, the future of the space was uncertain. That is until one fateful morning when Lake Forest Park resident Anne Stadler bumped into Ron Sher in line for coffee at the Honey Bear. A visionary who shared Ron’s passion for community and an activist with plenty of practical experience, Anne proposed setting up a nonprofit organization to manage the Commons. Ron encouraged her to do it, and the adventure began. And the adventure continues. At the Breakfast, Anne spoke passionately about the Commons as a place that continues to evolve, welcoming an even broader diversity of people, engaging their imaginations and willingness to participate in this ever-unfolding experiment. After the interview, members of the Lake Forest Park Rotary Club presented this year’s Jeff Award. Named after Jeff Weissman, beloved Rotarian and retired owner of Great Harvest Bread Company, this award recognizes a Lake Forest Park business or organization with an exemplary commitment to high ethical standards and public values. 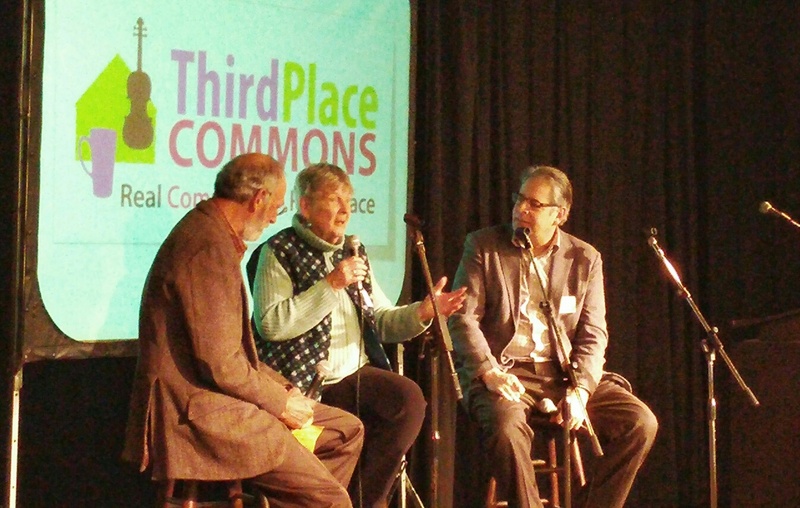 Ros Bird was surprised by the invitation to return to the stage and receive the award for current and past board members of Third Place Commons this year. When he returned to the podium, Steve Scher was obviously moved by the commitment of our community to Third Place Commons. He reminded us how fortunate we are to have this special place. And after every good word has been spoken, the success of the Breakfast is reflected in the amount of money we raise. Apparently, our guests agreed with Steve’s assessment, and stepped up to help fund our programming. Our tenth breakfast drew more people than ever, and when the last donation is counted, we will have made over $38,000 in support, the most so far for this event. 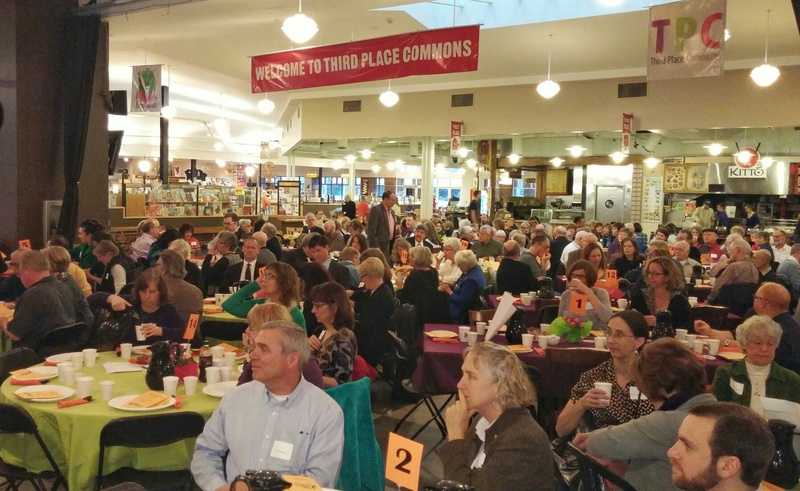 We are grateful to every table sponsor who brought friends and colleagues to celebrate the fifteenth anniversary of Third Place Commons. The auction this year was a great fun(d)raiser, and we thank our friends at the Lake Forest Bar and Grill,The Resort at Port Ludlow , Stephanie Kallos, Third Place Books, Honey Bear Bakery, and Arnies in Edmonds. Third Place Commons Board members put together a bucket of different beers, and although we still have not figured out how to serve mimosas at the Breakfast, at least the winning beer bidder left happy. Once again, Honey Bear Bakery kept everyone happy with an abundance of bacon. The Lake Forest Park Youth Council and students from the Shorecrest Interact Club helped us set-up, serve, and put everything back in place.